Announcing his full title as he strides into battle, Gyoubu Masataka Oniwa is certainly imposing. His giant spear and unrelenting speed curate a battle unlike any you’ve been used to so far in Sekiro: Shadows Die Twice. Oniwa is the first boss of the game and holds a precious Battle Memory, the only means by which you can upgrade your attack power in the game. On top of all of this, he is also the stopgap between the Wolf and Ashina Castle, where the main meat of the game is staged. As you drop into the wide open arena, it’s natural to get stage fright. Embrace the adrenaline and start running, straight at him, taking advantage of the fact he’s not attacking just yet. For most of this battle, you want to hold the B/Circle button. Oniwa is fast and has plenty of reach with his spear. Combine this with multiple perilous attacks, and you realize you’re up against a foe who doesn’t care where you are, just that he kills you. Keep running until you see a grapple icon on Oniwa’s head. Zip towards him and slash as soon as you get the chance. This is reliable damage you can conduct at every opportunity if you’ve got the mid-air slash skill. If you’re really struggling, use the firecracker prosthetic to make his horse buck, creating an opening for multiple slash attacks. Beyond that, stay close and abuse his low posture. A few quality deflections will drop his health bar quicker than any attack damage will. Think of this boss battle like a training program in deflections. 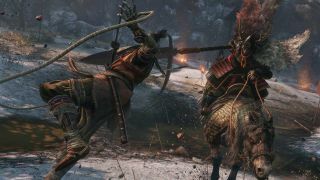 One thing you should know early about Sekiro is that ignoring the game’s harsh but fair rules is a fool’s errand. The quicker you get on board with the posture system, the easier the game will be, so deflect! Once you’ve got him on his hind legs, perform a Deathblow, but don’t forget the Shinobi Execution. The first of its kind, this is an essential follow-up to the Deathblow that kills off the enemy properly. Don’t put your controller down when you think you’ve got him beat! Keep all of this in mind and you’ll get rid of Gyoubu in no time, and the first Battle Memory will be yours. If you’ve been struggling on other bosses at this stage like Lady Butterfly, this will provide a much-needed boost to your sword damage that should give you the edge so you can come back stronger when the ascent to Ashina Castle becomes your next task.